The Caribbean is a spectacular destination for travelers of all types, and it's difficult to find better accommodations than those at the Bavaro Princess Resort. Found in the midst of the beautiful Dominican Republic on Bavaro Beach, this property beckons to guests with lush landscaping, gorgeous pools and luxurious accommodations. People who buy Punta Cana timeshares for sale at Bavaro can rely on an amazing experience each time they stay at this resort. There's something for everyone at this sleek and elegant property. 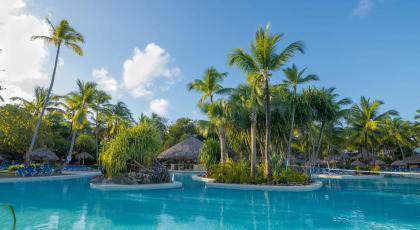 Guests at Bavaro Princess Resort often gather at one of the two adult pools while little ones love the swimming facilities that are reserved especially for them. With no fewer than eight themed restaurants, there is a cuisine on site to tempt even the pickiest palate. The nine bars offer eclectic experiences from the ultra-laid back to glamorous nightclubs complete with live music. Adults and children flock to the many hosted activities. The Kids Club is especially popular with the resort's youngest guests. Working out at the gym, enjoying the sauna, trying the games of chance at the casino or playing tennis on one of the many courts are just a few of the ways that guests can spend their days. This all-inclusive property features deluxe, suite-style accommodations. Each unit boasts air conditioning to ensure guest comfort and a 32 inch plasma television. Bathrooms are luxuriously equipped with a Jacuzzi tub. The balcony or terrace is the ideal place to enjoy a cocktail and the gorgeous view. Upgrading to a Platinum Suite provides extra amenities and services like a DVD player, plush bathrobes, beach towels, private check-in and discounts on spa treatments. The Bavaro Princess Resort has become synonymous with exceptional vacation experiences in the Caribbean. Choose these Punta Cana timeshares for sale to make the most of your time in the Dominican Republic. Contact Bavaro Princess Resort Specialist Today!